I love McDonald’s Snack Wraps. They’re a guilty pleasure of mine. Not for a snack, they’re a bit much for that, but for lunch occasionally. However, I don’t like the way they make me feel when I eat them. Like a heavy, greasy, unhealthy bomb in my stomach. So now I make a cleaned up vegetarian version at home. These probably still aren’t the healthiest things, but I love them anyway. They don’t make me feel gross and have more flavor then the McDonald’s version. I’m not certain vegetarian chicken patties qualify as real food, but they're pretty darn tasty! I far prefer them to real chicken patties. 1. Cook Chik Patties according to package directions. Oven method works best, and use convection if you have it for crispier breading. 2. Place the tortillas on a plate and cover with a paper towel. Microwave on high until warm. About 30 to 45 seconds. 3. Slice the chicken patties into strips. Arrange one patty's worth of strips on a tortilla and add spinach, onion, a drizzle of your preferred dressing, and some pepper. Fold the bottom upward so the stuffing doesn’t come out. Then roll into burrito shape. Repeat with remaining tortillas. That is good, how was the vegetarian chicken? I can't seem to find a good vegetarian subsitute. I don’t often use meat substitutes because I find I don’t need them or there are better recipes without them. The only ones I use on occasion are MorningStar Farms Chick Patties or Nuggets, and MorningStar Farms Spicy Black Bean Burgers. Oh and I like the chik patties a lot! They might be worth trying for you. I'm there with you. Though it is so good, it is so bad for you. I've never tried the McDonald's wrap before, but your wrap looks good and healthy!! Not a good idea to look at your blog when I'm starving!?! This looks SO GOOD!!! Have a great weekend Laura! Now this is my kind of snack-wrap! Oh yeah, I think I'm picking up some chick'n patties this week. I'm gaga for them--I think they're my favorite fake meat food. I also buy the Boca brand & Quorn is good too. Hey, how come the comment thing changed and there's no longer a way to leave your name and website? Guess I'll have to leave it with my google ID. @ Chef E - Lol yeah my husband would be happy too if I could work on the Big Mac. @ Veronica - Sorry about that. I closed some of the comment settings to try to block the spam. I've reopened it now. Loved your shot of the wrap! Great idea to use these meat substitutes I need to check them out. I agree with you--the snack wraps are great when you are really hungry, but you regret it afterwards. My homemade version has Red Hot Buffalo sauce--McDonalds should get on that one! HI there, Laura! love this version of wrap...pic looks great too! I am in the process of building that blog. In the meanwhile, please visit my main food blog, Dakshin -http://southernspiceworld.blogspot.com/ for more vegetarian ideas. Nice job! It's always great to recreate versions of what you love in restaurants so you know exactly what goes in to it. I haven't had a Mc snack wrap. but now I guess I don't need to. This looks fantastic. The wraps look so good! I'd like to try this for lunch sometime. I have the same feeling after I eat at McDonalds. This looks really good. My fav is the grilled chipotle bbq.... mmmmmmmmmmmmmm! I was just thinking the other day about making my own version at home. I'll have to start working on that. Thanks for the inspiration. Now, this looks like a grand vegetarian recipe! What a great idea! It looks so simple and delicious. I've been reading your blog for awhile and I just wanted you to know I'm giving you the "beautiful blogger" award! Now you have to pass it on! Hey, don't change your settings for me, esp if it helped stop the spam. I have no problem leaving it with my Google ID. I haven't had the McD's version, but this looks fantastic. And thanks for vegetarianizing it, Laura. You've saved me a step :). Another yummy, super easy recipe. These vegetarians thank you! Glad I could help. 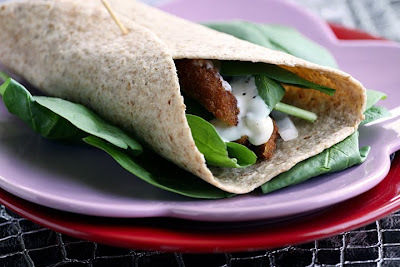 I really like these wraps and make them for lunch somewhat often. I hope you enjoy them too.